This is the reverse side of a small tunic, woven in 17th-century Peru, probably for a statue of a male saint (santo de vestir) to wear. The combination of cotton and camelid fiber has a long history of use in the Andes, as does the cherry-red cochineal dye and many of the design elements prominent here. The central section of the unku has been woven with a floral and bird pattern, set against a red background. The front of the tunic, also in Vistas, in contrast, has a deep-blue background with a red yoke. 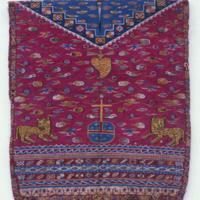 On the central axis, the votive heart appears to dangle from the neck of the tunic, almost like a pendant. Below, an orb and cross, quintessentially Christian symbols, appear between two felines, as is the case on the unku’s front. Here, on this side, the orb is much larger and the animals resemble Andean felines, like pumas, not heraldic lions. The color combination of the tunic—which emphasizes both red and blue—aligns the unku with Andean ritual garments worn not only by saints, but also children in the 17th century. The design of the garment, as well as its technique of manufacture, are fully colonial in style, but inspired by a wide range of sources: some pre-Hispanic in origin, others European, yet others distinct to Andean communities of the 17th century. If this tunic was, indeed, donned by a saint’s figure, then it evokes colonial practices once strongly indigenous and Christian—a combination born of political and military force but cultivated in unique ways by indigenous residents of Spanish America. Phipps, Elena. 2004. 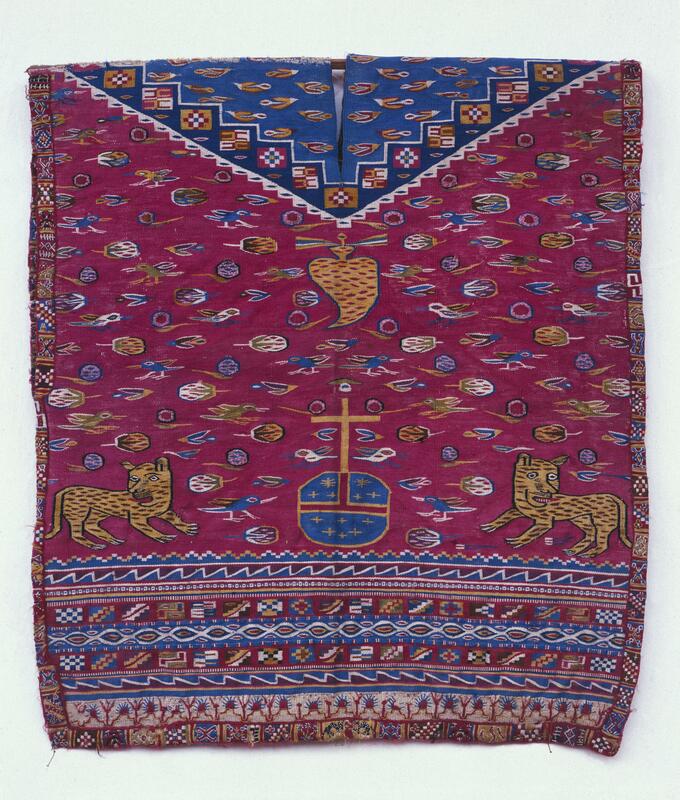 “Tunic (unku) for a child or a statue.” In The Colonial Andes: Tapestries and Silverwork, 1530-1830. Elena Phipps, Johanna Hecht and Cristina Esteras Martín, eds. New York: Metropolitan Museum of Art, 270-272. Pillsbury, Joanne. 2002. “Inka Unku: Strategy and Design in Colonial Peru.” Cleveland Studies in the History of Art 7: 68-103.